Jonny Gould's Soccermongery: Ten-match ban for Suarez: fair or foul? Ten-match ban for Suarez: fair or foul? 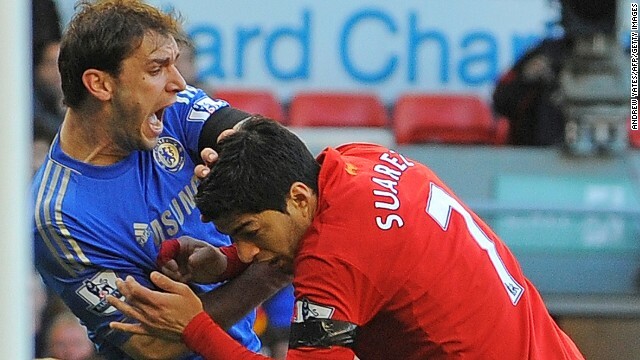 Liverpool will NOT appeal the Football Association's ten-match ban on Luis Suarez for biting Branislav Ivanovic. A charge of violent conduct usually carries with it a suspension of three games, but the FA decided to pile on an additional seven matches. The decision was made with such haste that Liverpool must've considered appealing. But in the end, the risk in an appeal going wrong might've had the FA slapping more matches on the ban. He’ll now miss the last four games of this season and the first six of next. So is a ten match ban for biting Branislav Ivanovic fair? Should Luis Suarez have received different treatment? There’s two ways to look at this. Few beyond the confines of Anfield and their supporter-base back Suarez. He’s been in scrapes before and when he got banned for eight matches for racial abuse, he was warned as to his future conduct. He’s even been banned for biting before when as an Ajax player, he bit a PSV player. He never played for them again. The FA have been hoisted by their own disciplinary petard. Having slapped an eight-match ban on him before, they’ve got to be seen to be inflating that number. It makes the process look ever so slightly arbitrary. The bigger the number, the more random the punishment. The FA stood by and did nothing as Callum McManaman tackled Massadio Haidara so recklessly and when Sergio Aguero nobbled David Luiz in the Wembley semi. So Suarez is a convenient fall guy. I think the FA acted in haste, under pressure from the potent cocktail of media scrutiny and public opinion but circumstances have worked in their favour.